Myanmar-based Kodots Games describes “Wanda” as a “tale of … finding companionship, love and hope in a wasteland.” The game introduces itself through a blue robot that somehow avoided damage, emerging out of its pod before starting its journey in search of anything that responds. 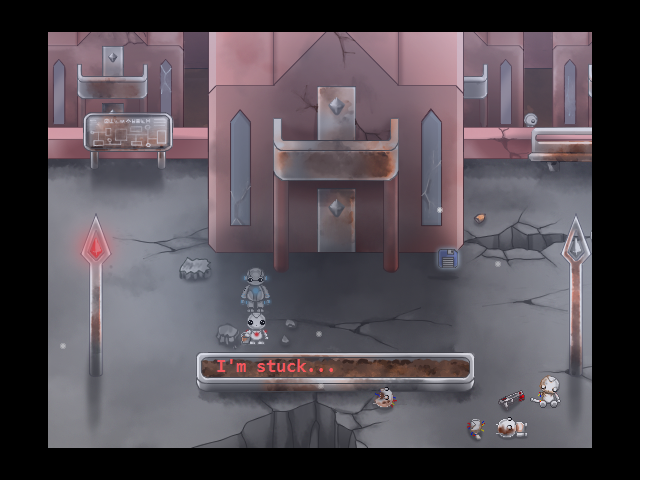 About a third of the way through, we meet another robot, this time red, and our small band of robots continue their journey in search of… anything. “Wanda” prides itself in being a “minimalist story-rich puzzle,” and rightly so. This game has no dialogues at all, only running with a series of robotic sounds and unknown symbols. Paired with the game’s soundtrack and a few bits of sound effects, the players are left on their own to observe and draw the story out for themselves. But is it really effective? I have to admit, there’s something inherently sad about a robot repeatedly making the same sound more than 50 times, which I assumed meant “Hello,” only to get no response. The beautiful artwork accentuates the feeling of sadness, leaving you to wonder what really happened in that world. 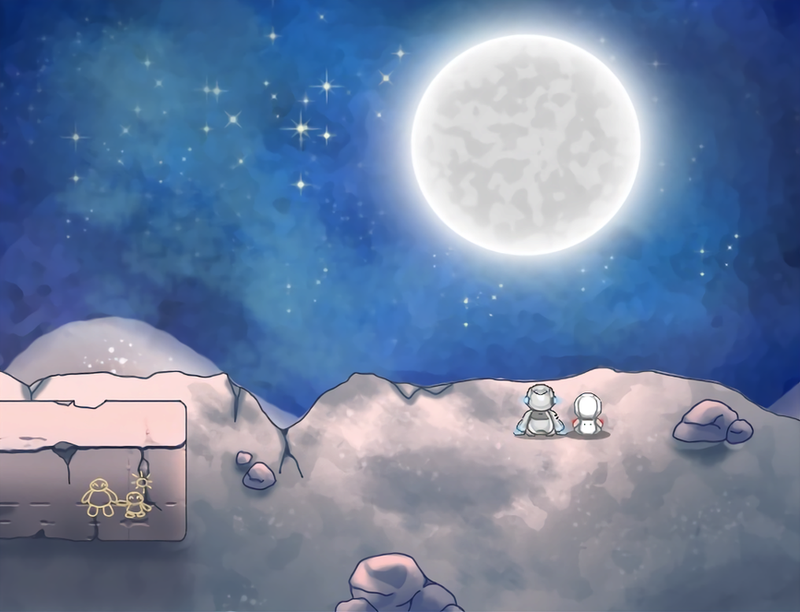 It’s clever, really, to make the player feel a sense of tragedy with everything that’s broken on the ground, only to juxtapose the scene with the beauty of the starry night sky. It’s a conflicting feeling, to say the least. However, I’d be lying if I said that “Wanda” hit me in my emotional sweet spot. Yes, I felt bad for our blue robot, cheered for him when he met the red robot, and felt bad for them when they’re being scared by thunderstorms, but I never quite connected with them as much. Their journey did not feel normal to me - it felt controlled and contrived. It felt as if their travels were simply a means to move the story along. The big plot reveal near the end did nothing to help this feeling, but instead magnified it. What could have been broken down into little intriguing morsels of information, to be scattered around as we journeyed through the world, was instead dumped on us at the last minute. There was a lot to be learned from that revelation and it answered a lot of questions I had, but the way it was presented was very uncharacteristic for the game. It was nice to finally learn of its overarching story, but I wish it wasn’t at the expense of my small connection to the robots. Perhaps I could also blame the placement and nature of the puzzles for my slight inability to completely connect to the story. You see, “Wanda” has an established cycle of narration-control-puzzle. In narration mode, we see a series of scenes showing our robots interacting and travelling. We have no control during this time. At the end of this phase, we are suddenly given the ability to move in order to reach the next area where a puzzle awaits us. The other problem, as I mentioned earlier, is the nature of the puzzles. There’s only about five puzzles in the game, none of which are complete brain-twisters. A common staple for these puzzles is the energy system, which dictates how many moves we can do before have to replenish it. This system adds to the complexity of the puzzles and encourages strategic planning, which is great on one hand but not on the other. 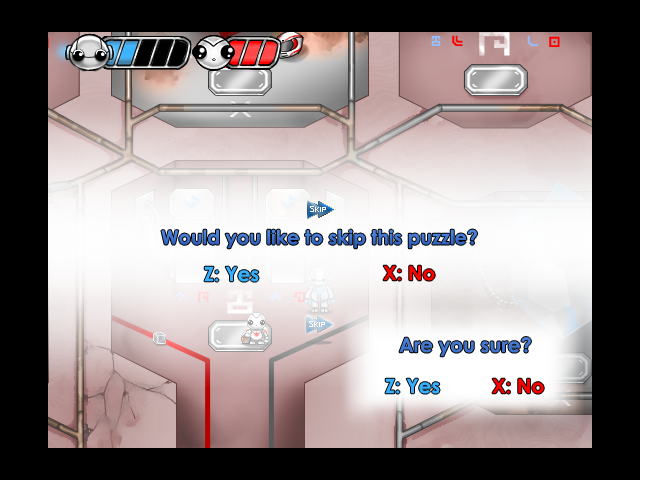 The main weakness of the puzzles and the energy system is the fact that it requires you to be perfect in one go. Its unforgiving nature serves nothing but to add frustration to those who are still trying to learn the puzzle. Trial and error is severely punished - opportunities to replenish your energy bar are very limited. Creativity is also penalized because the puzzles are designed to be solved in a specific way, making use of every single drop of energy you have. You will find yourself resetting the puzzles quite a few times, which would have been fine if it didn’t reset the entire puzzle sequence. Later puzzles have four or so parts to it, and having to reset the entire run because of a misstep is maddening. Rote memorization to solve multi-part puzzles is not fun. Would it really hurt to let us reset just that part of the puzzle instead of the entire run? Those who no longer want to deal with one more puzzle reset eventually get the option of skipping the entire puzzle. While I think it’s unfortunate to have this option (almost as if the developers have little faith for us to solve the puzzles), it’s great for those who don’t want to get bogged down with more puzzle resets and to just move on with the story. I had to use this on the last puzzle because after several attempts, I refused to draw maps and memorize routes. It was no longer a challenging puzzle to me. Despite all the complaints I have for “Wanda: A Beautiful Apocalypse,” I still commend the developers for all the efforts they poured into this game. The artwork is beautiful. The soundtrack, while it sounds inappropriately grand on some scenes, is wonderful. The story concept, despite all the hiccups in puzzles and pacing, is genuinely touching. At worst, “Wanda” probably would have been a better concept for an animated short, where we could watch the events unfold without having to interrupt itself. At best, “Wanda” is a game that succeeds in evoking deep thoughts and emotions without ever uttering a single comprehensible word. And I think that’s the magic of it. 2. Beautiful artwork, paired and a good soundtrack. 1. Puzzles punish you for trying. Reset option resets the entire puzzle. You have to be exact. 2. Unceremonious plot dump near the end. 3. Arbitrary collectable items hidden a tad too well throughout the game. 4. No clear indication of when the player regains control.